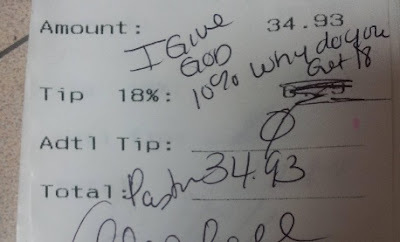 Is a waitress worth more than God? It was at this point that things changed from a nothing to something. Minister seems to have had a rush of blood to head because she writes over the bill "I give God 10 percent. Why do you get 18?" But rather than giving the waitress 10%, same as God, she ostentatously wrote a big fat "0" in the tip line and signed her name. Waitress was obviously bit peeved because she posted the bill on the internet - it went viral v quickly. Did not reflect well on Minister who publicly was very contrite but also called diner and had waitress fired. Wonder how congregation responded with the collection plate on Sunday? It's totally out of proportion to the $6 in question.